Mega Sale! Free Shipping Included! 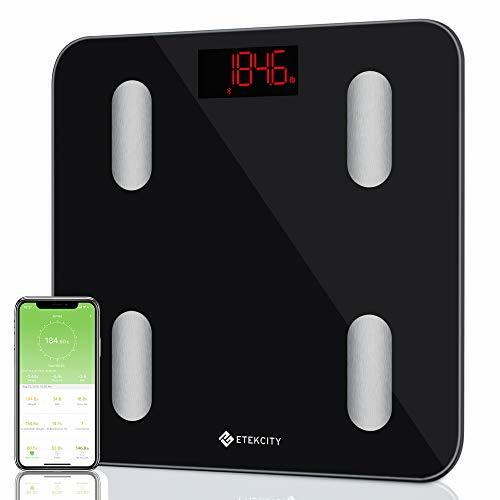 Save 26% on the Etekcity Smart Bluetooth Body Fat Scale-FDA Approved- Digital Wireless Weight Bathroom Scale, Body Composition Analyzer with app for Weight, BMI, Body Fat%, Water, Muscle Mass, Bone Mass, etc. 400 lbs by Etekcity at Utah Health Net. MPN: ESF24. Hurry! Limited time offer. Offer valid only while supplies last. Etekcity Smart Scale is your healthy assistant, which can measure 13 body metrics to show on Vesync Fit APP and can also sync with Fitness APP. Product size: 12.2" x 12.2" x 1.0"
ONE SCALE, UNLIMITED USERS-This smart body fat scale allows you to create unlimited member profiles to seamlessly track multiple users; a family can share one scale together. It's convenient when every member knows their body metrics and knows specifically what to work on. Especially helpful for body builders and those working on weight loss. HIGH ACCURACY-4 sensors with the latest technology deliver accurate weight measurements up to 400 lbs (180kg) in 0.2 lb/0.05kg increments. Enjoy step-on technology and auto-calibration, 3 x AAA batteries included. Easily change weight units through the app (lb/kg/st).